The excavations at Gault from 1999-2002 were primarily to recover information about the Clovis culture. Scientists were dealing with a paradigm shift as the old hypothesis of the peopling of the Americas 13,500 years ago began crumbling. Sites like Monte Verde, Meadowcroft and Cactus Hill suggested that people had arrived earlier than previously thought but archaeology did not yet have a new generally accepted hypothesis describing the earlier culture. Our feeling was that if you want to understand the earlier culture (especially without a lot of technological data) you should start with the earliest you know and see that what can tell you. Recovery of over 600,000 lithic artifacts from Clovis context at Gault enabled us to do that. What we found was the signature of a highly sophisticated and knowledgeable generalized foraging culture. The people that utilized Clovis technology knew a great deal about their surroundings, were not nearly as mobile as previously thought and used nearly all of the available local resources to survive. This was not the signature of a pioneering culture but rather one of a group that was comfortable with and knowledgeable about their area. The deep excavation at the Gault site. Consistently throughout the site we were finding possible traces of an earlier occupation at Gault in our deep test units. Often 50 cm below the Clovis occupation strata we would find debitage (the debris from human tool manufacture). In two test units in particular, one done in 2002 and one in 2007, the GSAR recovered a large number of debitage flakes and the soils they were found in were dated to 500 to 1,000 years prior to Clovis. This included a small fragment of a biface and many pieces of burnt chert debitage. In addition, our lithic analysts said that the debitage did not appear to be the same as that we were used to seeing from Clovis manufacturing at the site. 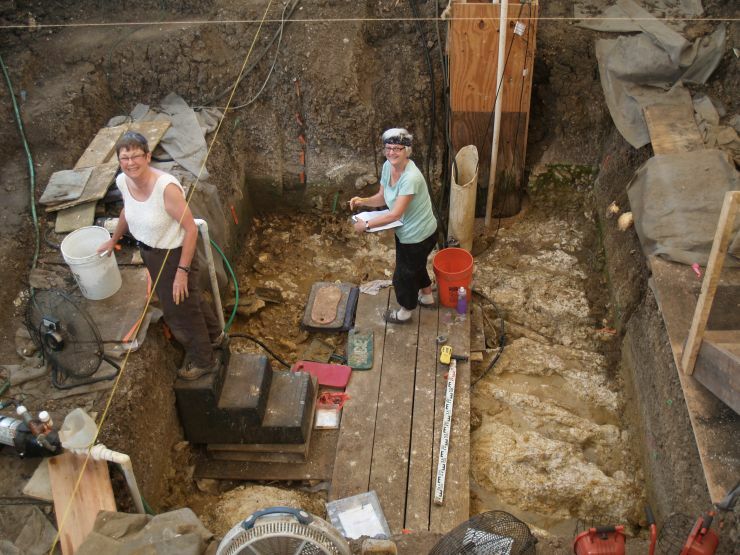 In the fall of 2007 we began a five year project to excavate a large stepped unit that would ultimately expose some of this deeply buried surface with the hope that there will be diagnostic tools and debitage in situ. The work has gone slower than was originally anticipated due to the fact that we also began to uncover a large portion of an unlooted Archaic burnt rock midden in the area. Since June 2013 the excavation at Area 15 has been substantially completed upon reaching bedrock. Other than some stratigraphic profiles work has moved into the lab for an estimated five years of analysis and publication.